Burnie is the 125 foot tall creation Aeromagic Balloons. Burnie weighs 475 lbs without the basket and burners! Burnie holds 105,000 Cubic feet of Hot Air. Burnie is 90 feet wide from finger tip to finger tip. throwing an amazing 17.5 Million BTU from each burner! Burnie was built in 2005. Burnie carry's 40 gallons of liquid propane for fuel. Burnie's athletic shoes are 15 feet long in length and are 9 feet wide! Burnie is a Friendly Little Devil and he would love to come to your event! Basically, a balloon flies because the air inside the envelope is hotter than the air outside (known as ambient air). Although some people prefer more technical explanations, it really is that simple! The burners heat the air inside and allow the pilot to control the rate of ascent & descent. 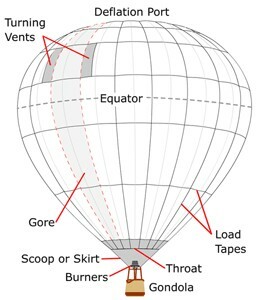 When it's time to come down, the pilot can either let the air in the envelope cool off on its own, or he can open a vent at the top of the balloon to let some air out - either way works. When it's time to land, the pilot will open the deflation port all the way to spill the air out the top and deflate the balloon. The balloon will then lay on its side and patiently wait to be packed up by the pilot and crew. The next phase is to find an instructor willing to teach you. Any commercial balloon pilot in the U.S. has the privileges of acting as balloon flight instructor, so there will be a number of pilots to help you get on your way. Training involves at least 10 hours of flight instruction, passing a written knowledge test, extensive ground instruction, and finally passing a flight examination with an F.A.A. inspector (also known as a Practical Test). Pass that, and you'll be granted your Private Pilot's Certificate for Hot Air Balloons! A private pilots' certificate allows you to take passengers up, but to be able to operate for hire, you must earn your Commercial hot air balloon pilots' certificate. This involves at least 35 hours of flight time and a much more stringent and demanding flight test. SIGN ME UP AS CREW! !